Available in 8-voice and 16-voice configurations, Moog One’s polyphonic sound engine is built on the most powerful synthesizer architecture ever employed by a Moog instrument. 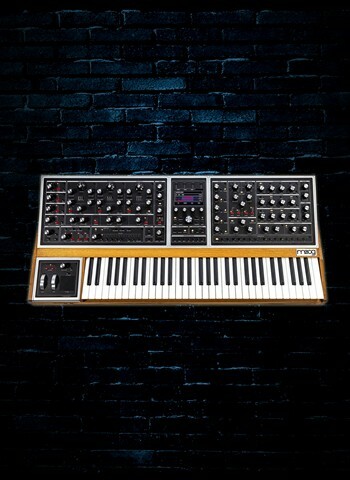 Per voice, Moog One offers 3 newly-designed analog VCOs, 2 independent analog filters, a dual source analog noise generator, analog mixer with external audio input, 4 LFOs, and 3 envelopes. To deliver an infinitely inspiring performance experience, each of the three timbres can be easily split or layered across Moog One’s expressive 61-note keyboard, each with its own sequencer, arpeggiator, and onboard effects library--including a suite of professional reverbs from Eventide.